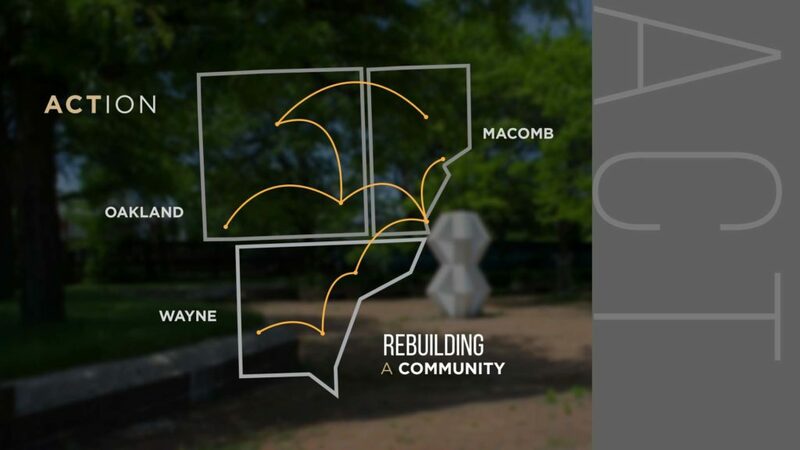 We recognize that everyone – residents of Detroit neighborhoods, suburban dwellers, the business and cultural communities, long-time residents, youth, emerging leaders and the public sector – must come together to build and be part of Detroit’s future. As the 50th anniversary date approaches in July of 2017, in bold contrast to the destructive negative energy of 1967, the Society and its unprecedented alliance of community partners will challenge metro Detroiters to come together in taking ownership and meaningful action toward creating a future filled with promise and opportunity. This aspect will be driven by specific tangible calls to action that will stimulate transformative and sustainable impact in neighborhoods, create inclusive projects and celebrations that foster unity and renewal, and contribute to regional cooperation across business, education, faith-based and community sectors. While the community calls to action are expected to take place close to the actual date of the 50th commemoration, July 23-27, 2017, work is already underway on several fronts. We are currently in discussion with the City of Detroit (Departments of Neighborhoods and Parks and Recreation) and Community Development Advocates of Detroit (CDAD) to support memorialization and revitalization placemaking projects that bring people together, provide historical context to physical spaces related to the unrest of 1967 and serve as a catalysts for the advancement and sustainability of neighborhoods across the city. Additionally, we are in ongoing meetings with the Detroit Regional Chamber to pursue impactful opportunities for the business community to be active participants in this and a variety of other aspects of the project.